Marlo Mortel says he channeled his pain of losing his mom to become more determined in doing his concert. Gearing up for his first major solo show, Marlo Mortel could not wait to showcase a different side of him as he will perform songs from the '70s up to the present. “This is my first major concert ever so super excited ako. imMORTELized kasi last name ko Mortel. And aim ko is for the audience to feel reborn kasi I’m gonna relive their favorite songs from th '70s, '80s, '90s up to now. Any age bracket talaga makaka-relate and mag-eenjoy kasi mga favorite natin since before,” he said. Despite having had a successful benefit concert in the past, Marlo Mortel admitted that he still feels pressured for his upcoming show. “Happy ako pero more on pressured kasi siyempre ‘di din naman ganun kadali gumawa ng concert. Pero sana madaming maka-appreciate ng preparations and sana madaming suporta. ‘Yun lang naman gusto ko,” Marlo said. 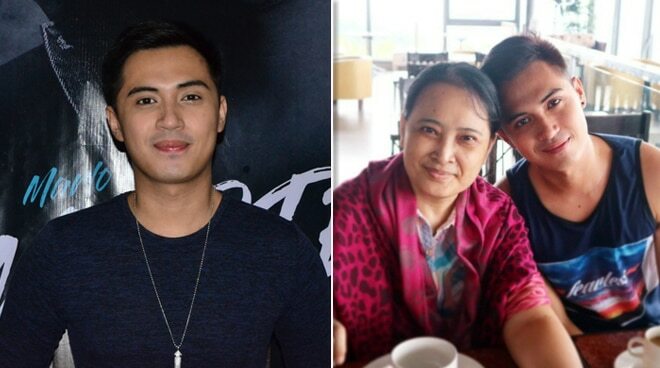 Marlo, who will dedicate his concert to his late mother who recently died of cancer, revealed what makes his upcoming concert special to him. “Dinededicate ko din ‘to para kay Mommy kasi isa din ‘to sa dream niya na magkaroon ako ng concert. Dream namin both kaya meron ako ditong mga portion na talagang it’s really for my mom,” he stated. “Well ‘yung lungkot tinurn ko na lang into determination na para sa kanya din naman ‘tong gagawin ko. And I know na kung buhay siya, ito ‘yung gusto niyang mangyari - ‘yung galingan ko. Kaya oo malungkot wala na siya pero kailangan mag-move on. Dito pa naman ‘yung Daddy ko and ‘yung ibang family ko. And I know she’s watching from above,” he added. According to the Kapamilya actor, he will also launch his debut album on the night of his show as well. Apart from Sue Ramirez, Marlo will also have several surprise guests. Marlo Mortel’s imMORTELized is happening on October 26 at the Music Museum.